So the whole concept behind Stamping 101 is that we use simple techniques to create projects that are cute or beautiful, but that don't require too many products or a lot of time. Last night I think we really met that goal. We made 3 projects and were done in 45 minutes! Our first project was this Trick or Treat card. This card was simple, and didn't take too long, but we did use a fair amount of product. We used the retired spider web embossing folder on Basic Grey card stock, then ran the Silver Encore Pad really lightly over the raised web design. A little strip of each design from the Witches Brew Designer Washi Tape add some colour and interest. 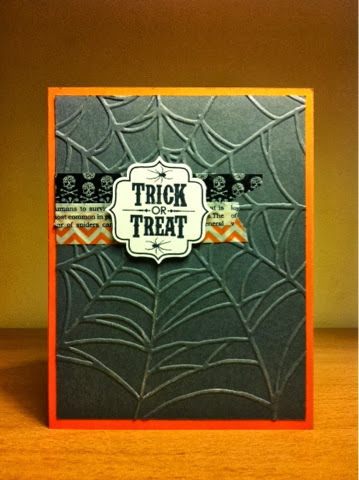 Finally, we stamped the Trick or Treat image from Tags 4 You on Very Vanilla, punched it out with the Bracket Label Punch and attached it with a Stampin' Dimensional. Next up, a card with no layers, no Big Shot, no punches. This card uses the magic of two-step stamping! This card was simple and we didn't need a lot of products, but it took a little bit longer to stamp. 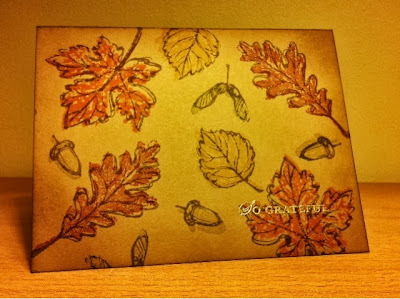 We started by stamping the different leaves from Gently Falling; each in a different colour onto Baked Brown Sugar card stock. We used Cajun Craze, Daffodil Delight, Pumpkin Pie, Pear Pizzaz, and Crumb Cake ink. Next we stamped the coordinating outline images over the coloured images, all using Baked Brown Sugar ink. Then we sponged the edges with a little Soft Suede ink. Finally, we stamped the Sentiment with VersaMark ink, and sprinkled on some Gold Embossing Powder which we melted with the Heat Tool. I took about 20 pictures of this card, but none were able to capture the way it looks in real life. The gold really stands out against the muted autumn colours. 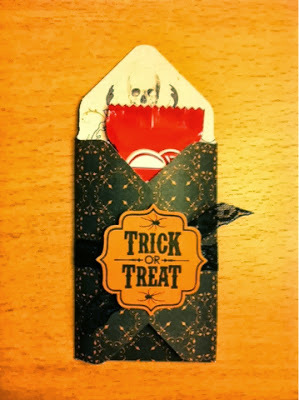 Then we used up some retired DSP to make this adorable, I mean spooky, Halloween treat holder. This project only requires a few products, was simple and really fast. We used the amazing Envelope Punch Board and the measurements for a gift card holder to make these, which means you only need a 5x5 piece of paper! We added a little ribbon and that same image from Tags 4 You. Slide in a Halloween candy bar and we're done! Five minute project. Love that! These could easily be made for any holiday or occasion. It even looks cute with just the little bit of ribbon and nothing else. Sometimes it's good to get back to stamping basics and create projects that remind you of what attracted you to paper crafting in the first place. What is your favorite simple technique?